It’s now the height of the tourist season in Istria. Most of the cars I see on the roads have foreign licence plates, every day there are tourist groups arriving by bus in the village, and I see many people walking around with cameras and an enchanted look in their eyes. This is also the time when friends and family come to visit. Since I often get asked how to travel to Istria from Italy, I’ve decided to write an informational post describing how to travel here and get around by car, bus, train, boat and plane. 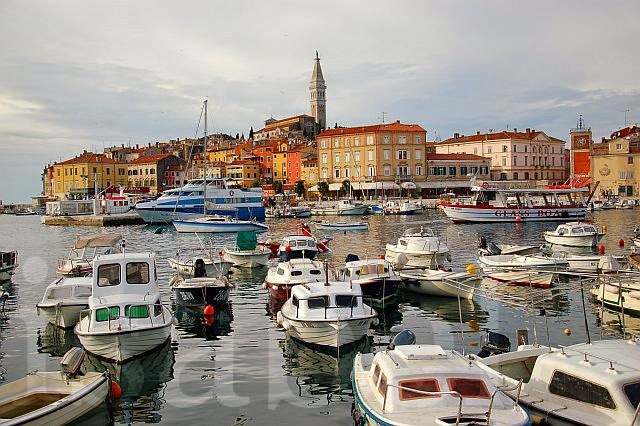 Istria is easily reached from Trieste, Italy by car, a drive which takes 1 to 1.5 hours depending on your destination. The route goes through a small part of Slovenia, where a toll sticker (vignette) is required to use the highway. Compared to other EU countries, the vignette is quite expensive at 15 EUR for a period of 7 days. (For example, in Austria it only costs 8.50 EUR for a period of 10 days.) However, an alternative is to take the secondary roads and avoid the highway altogether, which is what most locals do. The stretch along the Slovenian highway only runs for about 8km from Trieste to Koper anyway, so it’s not worth paying for the vignette if you’ll only be driving this short stretch. It can be tricky though to navigate the labyrinth of roads and overpasses when leaving Trieste. This handy link outlines the route to take. Head towards Buzet if you’re going to central or eastern Istria and towards Koper if you’re heading to the west coast or southern Istria. Though Croatia is part of the EU, it is not yet part of the Schengen Area, which means there are checkpoints at the Slovenian-Croatian border at Plovanija-Sečovlje, Kaštel-Dragonja and Požane-Sočerga. Kaštel-Dragonja is usually the busiest of the three during the summer season. Make sure you travel with your national ID card (if you’re a EU citizen) or passport. Most visitors travel to Istria by car and this is definitely the most convenient way to get around because public transportation is very limited. Roads are well maintained and since the Istrian peninsula is quite small, no destination is more than a 30- or 40-minute drive away. The highway in Istria (called ‘Ypsilon’ because of its Y-shape) is a toll road. Car rental agencies are located mostly in the tourist centres of Poreč, Rovinj, Umag and Pula. It’s a good idea to book a rental car in advance. There are daily bus connections between the cities of Padova, Venice and Trieste in Italy to several towns and cities in Istria. Some don’t run on Sundays, especially outside the tourist season. Fils has daily services (except Sundays) running from Venice and Trieste to Buzet, Pazin and Pula. During the summer there’s a daily direct non-stop bus between Trieste and Pula (Sundays included). Bus services in Istria are not very frequent and are mostly limited to major centres like Pula, Poreč, Rovinj, Pazin and Umag. For details and timetables, check the websites of the 3 bus companies: Autotrans, Brioni and Fils. There are no direct train services between Italy and destinations in Istria. The best option would be to arrive in Trieste by train and then catch a bus to Istria (see above). The bus station in Trieste is located right next to the train station. There is a frequent daily train which links Pula and Buzet and several towns on the way, including Pazin. During the summer this train continues on to Ljubljana, the Slovenian capital. Timetables are available on the Croatian Railways website. Sailing across the Adriatic Sea from Venice to Rovinj is probably the most romantic introduction to Istria. There are regular ferry services linking Venice and Trieste in Italy to the Istrian port towns of Poreč, Rovinj, Umag, Pula and Rabac. Ferries only run between June and September with more frequent services in July and August. This link on the Istria Tourist Office website lists the ferry companies operating between Italy and Istria. Of course more and more tourists are flying directly to Istria. Pula airport is one of Croatia’s busiest airports during the tourist season. This page on the Istria Tourist Office website has some useful information on scheduled and chartered flights to Pula. Rijeka and Trieste are other nearby airports.